Quadrant profile is best used around floor and room edges. 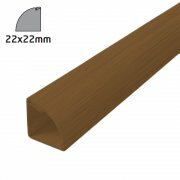 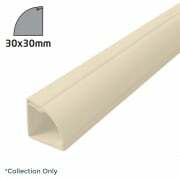 D-Line quadrant trunking also known as quarter round trunking is available in the following sizes; 22mm x 22mm and 30mm x 30mm, the volume of cables being concealed should be considered when selecting trunking size. Also there are a range of different accessories such as internal and external bends, flat bends, cable outlets, couplers and backboxes/outlets sections giving you a flexible system with which to conceal your wires. Check out D-line Quadrant Trunking Kits! Prices start from £4.61 for quadrant accessories kits and £25 for all-in-one quadrant trunking kits!